Brooklyn Union Gate Car train on the Lexington Avenue el at Myrtle Avenue. George Conrad Collection. In the last quarter of the 19th Century, the City of Brooklyn comprised of much of today's "Downtown Brooklyn". Brooklyn suburbs were areas such as Midwood, Bensonhurst, and if you were wealthy and didn't mind a long ride, the ocean areas of Brighton Beach, Manhattan Beach and Coney Island. Owners of the major hotels at the time, like the Brighton Beach Hotel and the Sea Beach Palace Hotel, were looking for new ways to attract new customers. As a result, they helped finance new steam railroads to the beach, but because each acted on his own, the steam railroads that "grew up" were disjointed, concentrated in the western and southern portions of Brooklyn, and really weren't built for the rapid transit that we know of today. Meanwhile, another company, the Brooklyn Union Elevated Railroad Company, was responsible for the creation of the first Elevated lines that fanned out of the City of Brooklyn. New areas of the land would become accessible, and with trains running over the Brooklyn Bridge to Park Row as early as September 1883, now the commerce center of New York would be a shorter ride away for these Brooklynites. The force that created rapid transit in Brooklyn was the American model of free enterprise. The first company to create the route would reap all the profits from passengers using that route. Eventually, all these companies and lines became the Brooklyn Rapid Transit Corporation, which eventually began running these lines as a unit. With the BRT came electrification and rapid expansion. Eventually the BRT would become a competitor to the Manhattan-oriented Interborough Rapid Transit Corporation (IRT), and would be instrumental in future New York City subway expansion. Like the IRT in Manhattan, the BRT was the only player in Brooklyn. This is the story of the rise of rapid transit in Brooklyn, including the early days of the Brooklyn Rapid Transit, from 1878 until the signing of the Dual Contracts in March of 1913. All of the first Brooklyn steam lines served different parts of Coney Island. Therefore, a brief synopsis of Coney Island around that time is being provided, in order to give you an idea of why it became so popular. In 1829, the Coney Island House opened, marking the beginning of Coney Island's status as a seaside resort. In 1844, The "Pavilion" was built on the western end of Coney Island and in 1847, steamboat service began between that location and New York. By the 1860s, Mike "Thunderbolt" Norton, a local politician with a reputation for corruption, opened a hotel in that same area, and the western part of Coney Island took on the name Norton's Point. Both the politician and the area became known for corruption. Austin Corbin was a successful businessman who did extremely well on Wall Street. In 1873, Corbin and his family moved to Coney Island on the advice of his son's doctor, for his son was gravely ill and the doctor recommended the sea and salt air for comfort. After the move, Corbin, then president of the Long Island Railroad, saw potential profits in the development of a seaside resort. He then bought 500 acres and started the Manhattan Beach Improvement Company. In 1877, this company built the Manhattan Beach Hotel, followed in 1880 by the Oriental Hotel. The Manhattan Beach Hotel was located on the far eastern portion of Coney Island (today's Manhattan Beach). His New York and Manhattan Beach Railroad would eventually serve his hotel. The second resort that was built was William A. Engeman's Brighton Beach Hotel, located west of Corbin's Manhattan Beach Hotel. Engeman amassed his fortune during the Civil War selling horses to the US government. The Brighton Beach Hotel opened just before the 1878 season and was patronized by the upper middle class. The wealthier beachgoers went further east, to the Manhattan Beach Hotel, because they felt the Brighton was too close to the portion of beach we call Coney Island today, which at that time, had a reputation for being an undesirable neighborhood. (For example, the Elephant Hotel opened at Coney Island in 1882 and became associated with prostitution, which prompted the local expression, "seeing the elephant.") The Brooklyn, Flatbush and Coney Island Railroad would serve the Brighton hotel. The Brighton Beach Hotel, in retrospect, was built too close to the ocean, for by 1888 beach erosion was so severe that the ocean threatened to collapse the structure. To solve this problem, it was jacked up onto railcars and, using BB&CI steam engines, moved slowly inland 600 feet. The move started April 3rd, 1888, and was completed on June 29th, 1888. The Culver Depot at Coney Island, 1916. Ed Watson/Arthur Lonto Collection. The third big developer was Andrew R. Culver who ran a steam line, the Prospect Park & Coney Island Railroad (the Culver Line), which terminated in 1875 at Culver Depot along Surf Avenue. His railroad offered regular service to Coney Island for a 35-cent fare. There was a marked increase of "common establishments" in the vicinity of Culver Depot. While the more well to do patronized the area east of today's Ocean Parkway, the middle class sought after the area west of Ocean Parkway, and the Culver Line was a key reason why. The final player in the Coney Island rail transportation picture was the New York and Sea Beach Railroad in 1879 that terminated at their Sea Beach Palace Hotel. The Sea Beach Palace was an enormous rail terminal, restaurant and hotel that was located several blocks west of Culver Depot. Horse racing was a favorite pastime of the upper class in the 1880s, and because of the well-to-do crowds at Brighton and Manhattan Beaches, a number of racetracks were built. These race tracks were key to the development of Coney Island because not only did the rich patronize the racetracks, but so did the not-so-rich. These huge crowds all needed a speedy way of getting to the track, and those that had too much to drink needed places to stay. Other not so lavish hotels sprouted up in the late 1880s like weeds. Other diversions would also be built. In 1882, Peter and George C. Tilyou opened the Surf Theater, Coney Island's first theater, on an alley later named the Bowery. La Marcus Thompson opened the Switchback Railway, the first roller coaster in America. By 1895, Sea-Lion Park, the first enclosed amusement park at Coney Island, was opened. In that same year, George C. Tilyou opened Steeplechase Park at Coney Island, with the now-famous "Steeplechase Horses" as the prime attraction. In 1903, Luna Park opened, and in 1904, the same year as New York's "First Subway", Dreamland would open. The first steam railroads were mainly built to serve hotels at the end of each line, and these hotels were owned by the same company as the railroads that served them. But by the turn of the century, the railroads were handling more crowds than they ever imagined. The Sea Beach Line began service on July 18th, 1877 as a steam railroad called the New York and Sea Beach (NY&SB) between the 64th Street Pier and Bath Junction (approximately where 62nd Street & New Utrecht Avenue intersect today). On July 17th, 1879, the steam line reached the Sea Beach Palace Hotel in Coney Island and terminated at Sea Beach depot, located between the West End and Culver depots (between today's West 8th and West 11th Streets). While it was the last line to service Coney Island, it was not supposed to be. It was chartered on September 25th, 1876. Construction between Coney Island and Bath Junction was completed on June 5th, 1877. However, a dispute with the New York and Manhattan Beach Railroad (NY&MB) over track gauge delayed full service for two years. The NY&MB, originally planned to be at standard gauge, was to be changed to three-foot narrow gauge due to the availability of nearly new equipment in this gauge from the Philadelphia Centennial Exposition in 1876. For the NY&SB to run over NY&MB track to the pier, it would have to lay a third track, something Austin Corbin (president of the NY&MB) did not want. The NY&SB would not compete with his NY&MB for the same Coney Island traffic. The initial service was seasonal and ran only until September 1st, 1877. It did not run over the 1878 season due to construction. NY&SB owners realized that without a line to the Bay, their line would not turn a profit. They would not be able to share the NY&MB right of way. After various route proposals were tried and failed, the one adapted was the alignment similar to today's: from Bath Junction, the NY&SB would run parallel to the NY&MB on its south side to 8th Ave, cross the NY&MB, then run parallel to it on its north side to the 64th St pier. The crossing could not be avoided because the NY&SB was not able to acquire enough property north of 8th Ave to prevent it. In exchange for the rights to cross over the NY&MB, the NY&SB gave the NY&MB permission to share the terminal at the 64th St pier, and the NY&MB agreed to share maintenance of the pier. With the agreements in place, the NY&SB would open again on July 17th, 1879 over its full route. The NY&SB always tried to undercut the NY&MB regarding pricing as a result of this disagreement. They were somewhat successful, as most passengers chose the NY&SB to go to Coney Island over the NY&MB, because the NY&SB's terminal was in a more affordable part of Coney Island. Even when Corbin was able to negotiate a uniform one-way rate agreement between his carrier and all the others at 30 cents, the NY&SB did not buy into the agreement, and charged 25 cents. Corbin had even tried multiple times to buy out the NY&SB outright, but failed. The NY&SB was mostly single tracked over a private right of way and ran through relatively unpopulated areas. By 1885, the entire line was double-tracked. For its first few years, the line remained seasonal, opening in May and closing in September. The railroad experienced financial problems and went bankrupt in 1881. In 1883, the railroad was reorganized into the New York and Sea Beach Railway Company. With the new management, the 1883 season turned out to be a good one, and service continued until October 22nd. The seasonal service resumed on April 11th, 1884, and then the company announced it would run year round service. In 1886, the NY&SB leased the Sea Beach & Brighton Railroad and operated it as a NY&SB branch, from 86th Street near Ave W to Brighton Beach. The SB&B was a reorganization of the New York and Brighton Beach Railway Company, chartered to build a line from Locust Grove to Brighton Beach. It basically would have run from along today's 86th Street, crossed Ocean Parkway and terminated just west of the Brighton Beach Hotel. The Brooklyn, Bath &Coney Island, the NY&SB, The Coney Island & Brooklyn, the Prospect Park &Coney Island and the Brooklyn, Flatbush & Coney Island railroads were all opposed to this line crossing theirs at grade. Property owners on 86th Street were opposed, too. The route was eventually moved south over marshland and required to bridge all these other lines. It opened August 4th, 1880 from Locust Grove to Brighton Beach. Patronage was poor and financial problems mounted. The final blow was a fire of suspicious origin on July 27th, 1881, that destroyed the Brighton Beach terminal. When the NY&SB leased the SB&B, it never ran trains on it. The line's condition was poor and the bridges it crossed were in questionable condition. However, the rails on the SB&B trestles were still in good condition and would be used to replace the NY&SB mainline rails that were in poor condition. Portions of the line between Gravesend Ave (today's McDonald Ave) and Brighton Beach became the experimental Boynton Bicycle Railroad, an early monorail. Today, Boynton Place commemorates both the Bicycle Railway and the SB&B right of way. In 1889, the NY&SB opened up a spur into the Brooklyn Jockey Club racetrack than ran from roughly Kings Highway to Ave S. The spur was not successful and ran only that year. In 1895, the NY&SB suffered its only major accident, where a helper engine used to push NY&SB trains up the grade to the connection with the NY&MB struck empty cars being moved to the Coney Island bound track. The engineer tried to stop, but the impact damaged both the reversing lever and the throttle, which could not be turned off. The runaway engine struck a NY&SB train at Woodlawn station, where two died and 55 people were injured. Because the NY&SB ran through relatively isolated areas, help was slow in arriving. As a result of legal action and lawsuit settlements, as well as electrification by competitor railroads, the NY&SB went into bankruptcy in early 1896. By December 1st, 1896, the line had already been reorganized into the Sea Beach Railway. In 1897, the line was leased to the Brooklyn Heights Railroad Company. During 1897 and the first part of 1898, the line was electrified with trolley wire. Connections at 3rd Ave and 65th Street were made to the Brooklyn Heights 3rd Ave (Brooklyn) El. Track changes at both terminals were implemented. Other improvements were made. The rebuilt Sea Beach line was opened up on May 20th, 1898, and by 1900, the Brooklyn Rapid Transit Corporation had taken ownership of it. The Brooklyn, Flatbush and Coney Island Railroad began on July 2nd, 1878, between Flatbush and Ocean Avenues (Prospect Park) and the Brighton Beach Hotel, as an excursion railway, not a commuter railway. It was incorporated nine years earlier, on June 25th, 1869. Shortly after the route opened, plans were afoot to extend the line to Flatbush and Atlantic Avenues, to intersect with the Long Island Railroad. The LIRR would allow the BF&CI excursion trains to terminate at its terminal, and on August 19th, 1878, service to the LIRR terminal began. Over time, however, this relationship did not prove to be lasting. In 1876, Austin Corbin's New York and Manhattan Beach Railroad began running trains over narrow gauge to the Manhattan Beach Hotel using trackage that paralleled the BF&CI railroad between Ave H and Sheepshead Bay, a distance of three miles. In 1880, Corbin actually took over the LIRR. The line was regauged at standard gauge and in 1882, through a series of mergers and acquisitions, the LIRR ended up owning the NY&MB, and the BF&CI services were redundant and competitive. Furthermore, the NY&MB was a year-round operation, not just an excursion line. So on December 14th, 1883, the LIRR terminated the agreement with the BF&CI, and the BF&CI was cutback to Bedford Terminal, just before the point where the line joined the LIRR. One month later, without the profit generator that the LIRR connection was, the BF&CI went into bankruptcy. The BF&CI was then reorganized as the Brooklyn & Brighton Beach Railroad in 1887. After the reorganization, improvements to the B&BB were made. The line below grade was reconstructed with stone walls. A new terminal was built at Brighton Beach. Most significantly, the B&BB began negotiations with the Kings County Elevated Company to route its trains downtown via the Fulton Street El. No longer would the B&BB be an excursion railway; its connection with the Fulton Street El meant that the line would become a bonafide rapid transit line serving commuters. The LIRR, again seeing the B&BB as a threat, went to court and tried to stop this plan from proceeding. The LIRRs attempt to influence commissioners notwithstanding, through service from Brighton Beach over the Fulton El to the Brooklyn Bridge at Sands Street began on August 15th, 1896. The Brighton Line was electrified using trolley wire from Fulton St & Franklin St to Newkirk Avenue, and then to Brighton Beach in 1899. In the spirit of "if you can't beat 'em, join 'em", the NY&MB began running from the Brooklyn Bridge, via the 5th Ave El, to a new ramp that connected the 5th Ave El with the NY&MB at 36th St and 5th Ave. In 1900, the BRT took control of the Brighton Line. When the Fulton St El was electrified, a ramp to the Brighton Line at Fulton & Franklin was built, and through trains to Park Row, Manhattan, via the Brooklyn Bridge began on July 9th, 1900. These through trains supplemented and then replaced cable car service over the span. The electrification also enabled streetcar companies that were absorbed by the BRT to use the Brighton Line to run trolleys to Coney Island. A ramp at Prospect Park was built to enable this connection, and it remained in use until 1905. As part of BRT ownership, the LIRR's Manhattan Beach branch received connecting service from the Brighton Line at Sheepshead Bay. The Prospect Park and Coney Island Railroad began service on June 19th, 1875 as a steam railroad between Prospect Park (9th Ave. and 20th Street) and Gravesend Avenue and Neck Road. Built by Andrew Culver, it also became known as the Culver Line, and in fact, carries his name to this day. On July 27th of the same year, the steam line reached Cable's Hotel (later known as the Ocean View) in the West Brighton section of Coney Island at Culver Terminal. Culver Terminal was the predecessor to today's Stillwell Avenue; its original location was at Surf Avenue and West 5th Street approximately where the Brightwater Towers stand today. Culver Terminal was a surface terminal adjacent to a roller coaster. The West Brighton section of Coney Island used to refer to the Coney Island we know of today, west of West 5th Street at Surf Ave. Originally single-tracked when it opened, the line was double-tracked by April 1878. Unlike the BF&CI and the NY&SB, the PP&CI was built to serve the many villages it went through. It did not suffer financial constraints from being a seasonal operation. In 1879, the railroad leased the New York and Coney Island Railroad, and service began between Culver Terminal and Norton's Point, the very western most tip of Coney Island. Connections to steamboats to/from New York City were made at Norton's Point. The Norton's Point line was electrified in 1899. Upon electrification, El cars were used to transport passengers between the steamboats and Culver Terminal. Around 1910, streetcars replaced El cars; in May 1918 when Culver trains terminated at the new Stillwell Ave terminal, El cars resumed the service, but it was short lived. By October 1919, streetcars once again took over service requirements until the line's demise. The Long Island Railroad acquired a majority interest in the PP&CI in 1893, and a trackage rights agreement enabled it to use the LIRR from Parkville (today's Ave I) to a ferry landing (likely in Bay Ridge) that would enable ferryboat transfers for passengers wishing to go to the beach. From 1893 to 1899, the LIRR owned and operated the Culver line as a part of the New York and Manhattan Beach division. In 1895, a connection was made between the Fifth Ave. Elevated line and the Culver line, enabling trains to travel directly from Brooklyn Bridge to both Manhattan Beach (via the LIRR) and Coney Island (via the Culver line). The PP&CI was electrified in 1899, and LIRR steam passenger service ended. The LIRR was also losing money, and saw an opportunity to be rid of the PP&CI and end their fight with some of the other Brooklyn companies. The BRT took over the PP&CI on April 1st of that same year. The same agreement that enabled the BRT to take over the PP&CI gave it a virtually free hand in Brooklyn with the exception of some LIRR routes. In turn, the LIRR got a free hand in Queens, and retained trackage rights on the South Brooklyn and PP&CI routes. Some BRT surface lines started using the PP&CI for through service to Coney Island. Coney Island - West End Depot, 1915. Ed Watson/Arthur Lonto Collection. Construction on the Brooklyn, Bath and Coney Island Railroad began in 1862, the earliest of all the lines to serve Coney Island. It began service in 1864 as a horse-drawn line between 25th St and 5th Ave in South Brooklyn to the Bath section of Brooklyn, which in today's map would be 65th Street and New Utrecht Avenue. In 1867, the line reached Coney Island, making it the first steam railroad to reach the Atlantic Ocean at this location. Eventually, the horses were replaced with steam engines. In 1885, a branch was built from 5th Avenue and 38th Street to Second Avenue and 39th Street as a ferry connection. Also in 1885, the BB&CI was reorganized into the Brooklyn, Bath and West End Railroad. In 1889, when the 5th Ave El reached 5th Ave and 36th St, the railroad was abandoned north of 36th St. Trains then ran from 2 branches, one from the ferries and one from the junction of the 5th Ave El, to Tivoli's Hotel in Coney Island. The two branches joined in West Brooklyn, which is approximately where New Utrecht Ave & Ft Hamilton Pkwy meet now. On May 30th, 1890, the BB&WE and the Prospect Park & Coney Island Railroads shared a Union terminal at 36th Street and 5th Ave, along with a stairway enabling a connection to the 5th Ave El. On November 10th, 1893, the line was electrified with trolley wire and merged with the Atlantic Avenue Railroad which itself merged with the Nassau Electric Railroad in 1898. Also in November of 1893, the Atlantic Avenue Railroad started running streetcars on the line, and in early 1894, railway post office mail was begun on the line to Coney Island. The BRT tool the BB&CI over in 1898. The very first elevated line in Brooklyn, elevated in the sense that most of it ran above the ground, not on an "El looking" structure as we know it, opened in 1881. It was the one mile long Coney Island Elevated Railway, and ran from the Brighton Beach Hotel to a terminal just west of the Culver Terminal. It used iron bridges at road crossings, and wooden pilings and columns elsewhere. It ran generally along the route of today's Brighton Line between Brighton Beach and West 8th Street. There were no intermediate stations on this line, which ran seasonally in the summertime only. In 1886, the Coney Island Elevated was reorganized as the Sea View Railroad and purchased by the BRT in 1897. The BRT electrified the line, then tore the structure down in 1900 due to its poor condition and extended the Brighton line, via the right of way on the surface where the line once stood, to Culver Terminal. While steam railroads on the surface were being built to Coney Island for beachgoers, steam elevateds were being built to handle commuters into downtown Brooklyn and to steamboats into New York. The first line to open was operated by the Brooklyn Elevated Railroad (BER) in 1885. Known as the "Old Main Line", it ran from Washington and York Streets to Gates Ave and Broadway. Later in 1885, the line was extended to the Manhattan Crossing station at East New York. In September 1885, it was extended east to Alabama Ave and in November 1885 extended west to Fulton Ferry. April 10th, 1888 saw the opening of the Myrtle Ave El from Adams Street to Grand Avenue, where it joined the "Old Main Line" to DeKalb Ave. June 25th, 1888 saw the extension of the "Old Main Line" to Driggs Avenue via Broadway, and July 14th, 1888 saw the line extended west to Broadway Ferry. The line on Broadway became known as the Broadway - Brooklyn El, and is still called this today. On September 1st, 1888, the Myrtle Ave El was extended from Adams Street to Sands Street at the Brooklyn Bridge. The 5th Ave (Brooklyn) El opened on November 5th, 1888, from Park & Hudson Avenues, into the "Old Main Line", to Atlantic and Flatbush Avenues. Service ended two days later, on November 7th, due to an accident at the corner of Myrtle and Hudson Avenues (a Myrtle Ave El train collided with a 5th Ave El train). It remained out of service for months. On June 21st, 1889, the 5th Ave El was extended to 3rd Street and service resumed between 3rd Street and Brooklyn Bridge, but service remained discontinued between Myrtle and Park Avenues. On August 15th, the El was further extended to 25th Street, followed by another extension to 36th Street on December 9th. On May 30th, 1890, 5th Ave El service was extended to 38th Street, and a stairway connected it to the Brooklyn, Bath & West End Railroad and Prospect Park & Coney Island Railroads' Union terminal at 36th Street and 5th Ave. On October 1st, 1893, the El was extended to 65th St and 3rd Ave. The line ran on 3rd Ave to 38th Street, turned on 38th Street for two blocks before turning again onto 5th Ave.
On April 27th, 1889, the Myrtle Ave El was extended to Grant Avenue, but there was no through service from Broadway because there was no track structure between the "Old Main Line" and the Myrtle Ave El at Grand Ave. Through passengers would have to alight at Grand Avenue on the "Old Main Line", walk to the Grand Avenue station of the Myrtle Ave El, and then continue their trip. On July 20th, 1889, the El was extended to Wyckoff Ave, and crossed over the Broadway - Brooklyn El. There was no connection between these two lines, and it is unclear if there was a passenger transfer between these lines when the Myrtle Ave El was extended. On December 9th, 1889, through service was opened between Wyckoff Ave and Fulton Ferry. Also at this time, the portion of the 5th Ave El that was discontinued between Myrtle and Park Avenues reopened to "Old Main Line" service. December 30th, 1890 saw the first El abandonment in Brooklyn, that of the "Old Main Line" between Myrtle and Hudson Avenues. This part of the "Old Main Line" was known as the Park Ave El, and it was abandoned because its service was redundant with that of the Myrtle Ave El. Three years later, on May 30th, 1893, the "Old Main Line" was extended further east to Cypress Hill Cemetery at Jamaica Avenue. Also during 1893, some of the earlier stations, Washington Ave and Vanderbilt Ave, were reopened in new locations as a single island platform (instead of two side platforms). On May 24th, 1883, the Brooklyn Bridge opened. Fearing that the bridge could not support the weight of steam locomotives, a cable car service by the New York and Brooklyn Bridge Railway began exactly five months later. The Brooklyn Bridge line was electrified on November 30th, 1896, but the cable method was still predominant at that time. On June 18th, 1898, partial through service to Park Row, Manhattan via the Myrtle Ave El began. Shortly thereafter, the 5th Ave and Lexington Ave Els also began service to Park Row. July 17th, 1898 saw the first joint service between the Brooklyn Elevated Railway and the LIRR. 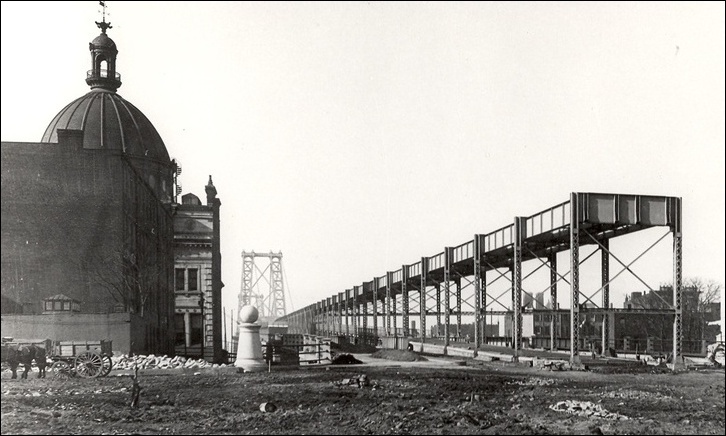 The Chestnut Street incline opened connecting the Broadway - Brooklyn El to the LIRR at Atlantic Avenue and Rockaway Avenue. El trains ran through to Rockaway Park. On October 4th, LIRR trains ran through service from Broadway Ferry to Jamaica using the incline. This service lasted only three months, ending January 10th, 1899. On April 24th, 1897, an incline from the Fulton Street El at Grant Avenue opened, permitting trolleys of the Long Island Electric Railway to operate up to the El level. This service ended four years later, on April 1st, 1901. The second joint BER - LIRR service began October 24th, 1899, when the LIRR ran service from the Brooklyn Bridge, via the 5th Ave and Myrtle Ave Els, and the LIRR Atlantic Ave line, to Jamaica. A connection between the 5th Ave El and the LIRR was opened up at Flatbush Avenue. This was the last joint service with the BER, for in 1899, it was absorbed into the Brooklyn Rapid Transit Corporation. On January 19th, 1896, papers were filed by Timothy S. Williams to incorporate the Brooklyn Rapid Transit Corporation (the BRT). The BRT was not an operator, simply a holding company set up to acquire the properties of the other transit interests. Shortly after incorporating, the BRT began a campaign of acquisition of various streetcar, elevated and steam roads. By 1900, the BRT had taken over the Sea Beach Railway. In 1899, the Nassau Electric Railway, which took over the BB&CI, was now under BRT control. The Brooklyn Elevated and Union Elevated railways were consolidated into the Brooklyn Union Elevated Railroad Company in that same year. In fact, by this time, most of the Brooklyn railroads were in financial straits, and the BRT simply gobbled them up. By 1900, every Brooklyn line was under BRT control, except the Brooklyn and Rockaway Beach Railroad (the Canarsie Line), which didn't fall under BRT control until 1906. The Brooklyn and Rockaway Beach Railroad Company began operations on October 21st, 1865 from East New York to Canarsie Landing. This was a steam dummy line running on the surface, and the entire line was single track until 1894, when it was double-tracked. The line ran down Van Sinderen Avenue to Linden Blvd, then via a private right of way to Rockaway Avenue (Parkway today), then between East 93rd and East 94th Streets to Canarsie Landing. Trains would meet connecting ferries for the trip across Jamaica Bay. In May 1906, the BRT set up the Canarsie Railroad Company to purchase the line, and this company then leased it to the Brooklyn Union Elevated Railroad Company. The BU elevated the line from New Lots Avenue to East New York, and relocated part of the line adjacent to the LIRR's Bay Ridge Branch. The newly rebuilt line was also electrified with third rail, and the line south of New Lots Avenue was electrified with trolley wire. The new line was opened on July 28th, 1906, with trains running to East New York, then the Broadway - Brooklyn El to The Bowery or Chambers Street. At Atlantic Avenue station, there was a connection to the Fulton Street (Kings County Electric railroad) line. The easternmost platform of this station is a remnant of this line. When fully operational, it served Fulton Street trains, Canarsie line trains and Broadway trains. With BRT control came electrification and through services on the Els. On July 3rd, 1899, the 5th Ave El was electrified to 36th Street, and on August 17th, electrification extended to 65th Street. By July 1st, 1900, the Myrtle Ave and Lexington Ave Els were electrified, as was the Broadway - Brooklyn El between Broadway Ferry and East New York. Just one month later, Manhattan Junction opened in East New York, allowing a connection between the Fulton Street and Broadway - Brooklyn El. May 30th, 1903 was the opening of another incline at Crescent Street. This incline was not for LIRR joint service - it was to allow through service of El cars from the end of the Broadway - Brooklyn El to 168th Street in Jamaica, Queens. El cars ran on the surface of Jamaica Ave with trolley cars under trolley wire. This service was the precursor to the Jamaica Ave El built during the Dual Contracts. On September 21st, the Bay Ridge incline opened in Brooklyn, connecting the 5th Ave El to Ft Hamilton Ferry via the 5th Ave El and surface tracks. Again, the service was provided by El cars running under trolley wire, but through service was not possible because the surface rails on 3rd Ave could not accommodate the El cars. Specific El cars were modified to permit this service, and passengers wishing to travel to Ft Hamilton would transfer to these El cars at 65th St. However, trolleys later took over the connecting service just two months later. The Crescent Street incline did not last very long, for on December 8th, 1903, it was abandoned because of a law enacted that made it unlawful to run elevated trains on streets. The structure, however, remained until 1924. The Chestnut Street incline saw continued service, and the LIRR electrified it on July 28th, 1906. A special adapter at the beginning of the ramp along the LIRR's Atlantic Ave line enabled the third rail shoe of the LIRR cars to be moved to the "correct" position for traveling over the El. Service ran to Broadway Ferry until May 30th, 1909, when LIRR service was extended over the Williamsburgh Bridge to the new "Manhattan Terminal" (today's Essex Street). Service lasted until September 3rd, 1917, and the structure was not dismantled until 1942 (although parts were torn down in 1924). April 11th, 1904 saw the closing of the "Old Main Line" between Myrtle Ave and Fulton Ferry. July 28th, 1906 saw the opening of a connection between the Canarsie Line and the Fulton & Broadway - Brooklyn Els at Manhattan Junction. Two months later, on October 1st, the Myrtle Ave El was extended to Metropolitan Ave via surface tracks starting at Wyckoff Ave.
As a result of a new LIRR terminal opening at Flatbush and Atlantic Aves in 1912, the LIRR's Flatbush Avenue connection to the 5th Ave El was ended. In 1901, BRT elevated trains began using the surface West End trackage, using trolley poles. Service connected to the West End from a ramp of the 5th Avenue elevated at 36th Street. Called the "5th Ave - West End Line", it ran using third rail from Sands St or Park Row to 36th St and then by trolley pole to Coney Island. Originally, the West End Line has its own Coney Island terminal, but in 1910, it shared its terminal with the Sea Beach line. In 1903, the BRT began Sea Beach through service between Bath Junction and Coney Island. During sunny summer weekends and holidays, the Coney Island Express ran from the Brooklyn Bridge via the 5th Ave El and the West End Line to Bath Junction, then via Sea Beach trackage to Coney Island. No stops were made between 36th Street and Coney Island. This was probably a reason why the Sea Beach line, when rebuilt as part of the Dual Contracts, had a non-stop express run from 59th Street to Coney Island; it was simply extending a service that had already been provided. In addition, trolley service along the Sea Beach line was provided between 65th St and Coney Island. As a result of numerous accidents, joint trolley and El car service on the Sea Beach line was stopped in 1907. This was done by coupling and uncoupling Sea Beach cars to/from 5th Avenue - West End trains at Bath Junction. Trolleys ran west of Bath Junction to the 64th Street pier and later to a ramp near 3rd Avenue. In 1903, a short surface extension connected the Brighton Line with the Culver Terminal in Coney Island. This right of way was the same used by the Coney Island Elevated before it was torn down in 1900. Between 1905 and 1908, the BRT performed a major upgrade to the Brighton Line, building much of its present right of way. The line was elevated from the Fulton El connection at Fulton and Franklin, then ran in an open cut from north of Prospect Park to Newkirk Avenue, then ramped up to an embankment to Sheepshead Bay, where the line descended to the surface for the last section to Coney Island. Between Church Avenue and Sheepshead Bay, there were four tracks. The use of trolley cars from Prospect Park to Brighton Beach was ended in 1905 as the upgrade began. The LIRR's Manhattan Beach line, located along what is today's East 17th Street, was moved immediately next to the Brighton's right of way, resulting in a six-track embankment. A spur to Sheepshead Bay Race Track off the Brighton Line (at today's Ave X) was also built. Remnants of the Manhattan Beach Line can be found along virtually all the bridge abutments along the Brighton Line from Ave J to Ave X. In addition, at Kings Highway a short fence that stood between the Brighton Line and the Manhattan Beach Line still stands today, in poor condition, at the edge of the Manhattan-bound local track. At Neck Road, the foundation to the LIRR's Neck Road station house still stands, as well as a walled off staircase leading up to it. Finally, the flyunder at Ave X still exists, but is filled in and without track. The steel trestle carrying the Brighton Line's right of way is still visible. The Brighton Line's right of way expands just north of Ave X for a short distance to accommodate the two additional tracks that provided service to the racetrack. Construction of the improved Sea Beach Line, January 1914. Looking east from 7th Avenue south of LIRR showing progress of constructing 8th Ave. station. Collection of Bruce Fedow. In 1906, the Sea Beach abandoned its 65th Street terminal in an agreement with the LIRR, where the Sea Beach took over the land at 63rd St and 2nd Ave to give the LIRR room for an expanding freight facility. In March 1907, passenger service to the 64th St pier was abandoned. The former terminal became a freight operation that was operated by the South Brooklyn Railroad, a BRT subsidiary. Also in 1906, the BRT began charging a 10-cent fare on its lines to Coney Island. Passengers traveling south of Kings Highway on all the former steam lines were charged this fare in order to make up some lost money by the predominantly summer-only patronage on these lines. This began one of many downward spirals of the BRT's customer relationship management, and the BRT came to be known as "Beggars, Robbers and Thieves". When passengers refused to pay the extra fare, the cars on which they sat were pushed onto sidings and left there. One newspaper account recalls a beach party held on a BRT car, where the car was used for kindling. While the fare was unpopular, it remained in effect until the Dual Contracts. As a condition of participating in the Dual Contracts, the BRT would lower the fare to a uniform five cents when all its southern routes were upgraded. The Culver Line was the last of the southern lines to be upgraded in 1920, and that's when the uniform fare was restored. In 1910, Sea Beach trains began terminating at West End depot. On November 30th, 1912, the Sea Beach Railroad lost its corporate identification when it merged with the Brooklyn Union and Canarsie Railroads to form the New York Consolidated Railroad Company. Recall that in 1900, the City of New York was barely two years old, having been comprised of the counties of Kings, Queens, Bronx, Richmond and New York. Downtown Brooklyn was once the City of Brooklyn, and commuters traveled to downtown Brooklyn as often as they were traveling to Manhattan over the Brooklyn Bridge. To best meet this demand, it was felt at the time to send trains into downtown Brooklyn and lower Manhattan, and have them loop back into Brooklyn without terminating. This type of operation would increase throughput to the downtown areas. The Brooklyn Loop Lines concept originated from this idea. Loops would connect to all transit lines running over the Brooklyn Bridge, and the Manhattan and Williamsburgh bridges when transit lines would be constructed over them. The Manhattan portion of the loop would run under Centre Street, but part of the proposed ROW was already in use by the IRT. The proposal was then changed to have a terminal built under a new city office building and it became known as Chambers Street. Construction began on January 27th, 1907. Since the area under construction was at one time a pond that was later filled in, construction of the Municipal Building proved difficult, causing delays in station construction so the foundations could be properly secured. The initial plans for Chambers Street comprised of a four track, five-platform station, later changed to a six-track station with seven platforms. This never came to pass and the original plans were used; however, provision for two additional tracks and pltforms was built into the station at the east end. The westernmost tracks of Chambers Street (the ones closest to the IRT Lexington Ave line), at the south end of the station, were built to curve eastward and climb to connecting ramps onto the Brooklyn Bridge. These ramps were located under the Park Row terminal, and were built, but tracks were never laid on them. The easternmost tracks, at the south end, were to connect to a proposed subway to William Street. On the north end, after a complex series of crossovers, four tracks would continue north to Canal Street and eventually the Williamsburgh Bridge, and the two easternmost tracks would also have a branch to cross the Manhattan Bridge. Chambers Street was built to be a through station that could handle heavy traffic; the outer and center platforms would be used for exit traffic and the remaining inner platforms used for boarding trains. The elevation of the westernmost tracks is higher at the south end of the station than the others, in anticipation of crossing the Brooklyn Bridge. The westernmost tracks serving the Williamsburgh Bridge opened for service on August 4th, 1913, a year before the Chambers Street station itself was completed on September 14th, 1914. The easternmost tracks serving the Manhattan Bridge did not open until the opening of the 4th Avenue (Brooklyn) subway and Sea Beach Lines (as part of the Dual Contracts) on June 22nd, 1915. The rest of the Manhattan portion of the Brooklyn Loop Lines became what is today known as the Centre Street Loop. It would be a four-track subway leaving Chambers Street, running under Centre Street, and then turning east under today's Kenmare Street and Delancey Street. There were four stations planned along the line, two of which would have had a layout similar to Nostrand Ave on today's IND Fulton Street Line. The portion of the line under Delancey Street would have connected to the Manhattan Terminal station (now Essex Street) built by the NYC Dept of Bridges. Two tracks would have directly served the trolley terminal built adjacent to the Manhattan Terminal station. In fact, the two-track structure that would have facilitated such a connection was actually built, but tracks were never installed on it. As the design of the loop progressed, the Triborough Plan of future routes and tunnel clearances was released, and the plans were later changed and the multi-level stations dropped, leaving stations at Canal St, The Bowery and Delancey Street. The tunnel clearances were changed to handle standard passenger car dimensions. Two tracks of the line would continue across the Williamsburgh Bridge and to connect to the Broadway - Brooklyn El for Jamaica service. Provision for a downtown Manhattan crosstown line under Spring Street was also built. And as a by-product of the Triborough Plan, in 1911, the BRT designed a new larger 10-foot wide steel car that would come to be known as the AB Standard when it was delivered in 1915. Construction of the elevated line from the Williamsburg Bridge, 1903. Ed Watson/Arthur Lonto Collection. The Williamsburgh Bridge opened on December 19th, 1903, and the connection to the Broadway - Brooklyn El was completed on December 31st, 1907. The Manhattan Terminal was "temporarily" opened on September 16th, 1908. Trolley service began at the new trolley terminal on May 18th, 1908 and the full station was officially opened on December 1st, 1908. Partial through service between Manhattan Terminal and Chambers Street opened on June 30th, 1913, and full service began August 4th, 1913. The Manhattan Terminal station was renamed Essex Street shortly before the 4th Ave (Brooklyn) subway opened in June 1915. The plans for a subway under 4th Avenue in Brooklyn were first proposed in 1905. Originally, the route had been planned for IRT service from the Contract II line to Atlantic Avenue; in fact, the IRT built provisions to connect to this route in the tunnel walls just north of the Atlantic Avenue station. However, by 1908, plans changed to have a different operator run the line and to use increased clearances in design. In addition, the line would connect to portions of the Brooklyn Loop Lines under downtown Brooklyn and cross the Manhattan Bridge. Construction began on November 13th, 1909. The section between Flatbush Avenue and 59th Street would have four tracks, and the section from 59th Street to 86th Street would have two tracks, but contain provisions for the addition of two additional tracks if future ridership made it necessary. It also contains the only "underground bridge" on the NY subway system, crossing over the LIRR Bay Ridge Branch while remaining under 4th Avenue. As the line was built, there were provisions for a turning loop under Flatbush Avenue near Nassau St (in Brooklyn) to turn trains when heavy traffic to Manhattan was not projected. Downtown Brooklyn itself was still a thriving metropolis of its own even after its consolidation into Greater New York. There was a provision for a four-track turnout under 40th Street in Brooklyn to connect to the West End Line. This turnout is the reason why the 95th St-bound local track swings out very wide upon leaving 36th Street. Provisions were also built for a future line to Staten Island; evidence today can be found as track pockets along both local tracks just south of the 59th Street station. When the Dual Contracts were signed in 1913, the 4th Avenue subway, already well under construction, was awarded to the BRT. As a result, plans were changed to connect the 4th Avenue to the Sea Beach Line at 59th Street, and the West End & Culver Lines at 38th Street. As a result of the 38th Street connection, the original 36th Street station was extended further north and the southern portion destroyed to make room for the connection. However, the original 36th Street station was built with two separate mezzanines, so the south mezzanine was closed, and the north one reconfigured to act as the sole mezzanine for the entire station. The south mezzanine, legend holds, is still accessible from a track stairway. These changes were completed in 1914. The 4th Avenue subway, providing service to Coney Island via the Sea Beach line, opened June 22nd, 1915. The 5th Ave El ran from Park Row, Manhattan, across the Brooklyn Bridge to Sands St, Brooklyn, then followed the Myrtle Ave El to Hudson Street. It then ran via Hudson Ave, Flatbush Ave and 5th Ave to 38th Street. At 38th Street, the line turned west to 3rd Ave, then ran via 3rd Ave to 65th Street. Trolley connections would extend the line to Ft Hamilton. The Culver Line ran from Park Row, Manhattan, across the Brooklyn Bridge to Sands St, Brooklyn, then via the 5th Ave El to 36th Street. From 36th Street and 5th Ave, the line ran to 9th Ave, then switched to surface running along an alley to Gravesend Ave (McDonald Ave), then along Gravesend Ave and private right of way to Culver Depot at West 5th Street and Surf Ave. The West End Line traced the Culver Line from Park Row to 9th Ave, then ran via the surface along New Utrecht Ave to 17th Ave, then via private right of way and Bath Ave to Bay 35th Street, then via private right of way to West End Terminal, located at Surf and Stillwell Avenues. The Sea Beach Line traced the West End Line to 62nd Street and New Utrecht Avenue, then via surface along today's Sea Beach Line to West End Terminal. The Brighton Line ran from Park Row to Sands Street, then via the Fulton Street El to Franklin Ave. Then the line turned south along the route of today's Franklin Ave shuttle to Prospect Park, then via today's route from Prospect Park to Sheepshead Bay. From Sheepshead Bay, the line ran at grade along the former Coney Island Elevated right of way to Culver Depot. The Fulton Street Line ran from Park Row to Sands Street, then a short private right of way to Fulton Street near Tillary Street. Trains ran on Fulton Street to East New York, then turned south on Van Sinderen Ave, then east again on Pitkin Ave (also known at that time as Eastern Parkway), then north on Euclid Ave, then east on Liberty Ave to Grant Avenue in the City Line section of Brooklyn. The Myrtle Ave El traced the Fulton Street El to Fulton Street, then via Adams Street to Myrtle Ave, then east on Myrtle Ave to Wyckoff Ave. At Wyckoff Ave, an incline was used to connect to surface tracks to Metropolitan Avenue. The Lexington Ave El traced the Myrtle Ave El to Grand Ave, then ran on Grand and Lexington Avenues and connected to the Broadway - Brooklyn El to Cypress Hills. The Broadway - Brooklyn El ran from Broadway Ferry (Broadway and Kent Ave), via Broadway, Fulton Street and Crescent Street to Cypress Hills. It later ran across the Williamsburgh Bridge to "Manhattan Terminal" and then extended to Chambers Street. The Canarsie Line ran from Canarsie Landing between East 93rd and East 94th Streets, then private right of way to New Lots Road (Avenue), then via elevated to East New York. It then ran via the Broadway - Brooklyn El to Broadway Ferry, and eventually Chambers Street. All Els were two track lines. The signing of the Dual Contracts in 1913 made the Brooklyn Rapid Transit a real player in future subway expansion. The formation of the majority of today's routes unfolded as construction continued. Additional provisions for routes never built continued to be made, and engineers proposed yet additional routes, long before the Independent City-Owned Rapid Transit System was a gleam in Mayor John Hylan's eyes. But as time went on, the BRT got cocky and adapted a "public be damned" attitude, with poor customer relationship management techniques. The "Beggars, Robbers and Thieves" rule of the land began deteriorating in earnest with a strike in late October 1918. As a result of pressing untrained motormen into service to cover the striking workers, the worst accident to befall rapid transit in New York City, the Malbone Street wreck, occurred on November 1st, 1918, where at least 93 people lost their lives. This was the proverbial "straw that broke the camel's back" and the company went into bankruptcy shortly thereafter. It remained in receivership until 1923, when it was reorganized as the Brooklyn-Manhattan Transit Corporation, or the BMT. The BMT brought with it a change in attitude, and some would say, the most colorful era in the development of rapid transit rolling stock since the introduction of the BRT Standards for use in the 4th Avenue subway in 1915. But the political winds in New York City were changing, and "Unification" was "the word". After several City administrations and financial troubles, in June of 1940, the BMT lost its identity as a corporate entity and became, simply, the BMT Division of the New York City Rapid Transit System. We'll examine the latter part of the BRT era, and the BMT, in future editions of this document, in the coming months. Electric Railroaders' Association: An assortment of NY Division ERA Bulletins published from 1959 - 1971. Also, Headlights, Sept-Nov 1975. Version 1.0, 17 February 2001. Copyright 2001 by Mark S. Feinman. Permission is granted to individuals to copy all or part for personal use, provided the copies are not sold for profit and this copyright notice is included.